I’m from Canada – no, scratch that, I’m from Montreal; the birthplace of the NHL, the home of the legendary and practically mythical Habs, and the heart, though at times it seems to be hooked up to a defibrillator, of the great sport of hockey. So, when I met a woman in Switzerland named Lena at a party near the capital Bern who turned out to be a true puckhead, I was naturally charmed. That is, of course, until she started bad-mouthing Canadian hockey fans as boring. Lena saw games in both Toronto and Montreal. Obviously, I thought, she was generalizing about her experience of the rich suits in the best seats at the ACC. It’s so quiet. Everyone is just sitting around. In Switzerland it’s a party. Really, Montreal? Okay, maybe in the reds where the fans that bleed bleu, blanc et rouge are barred by $250 ticket prices. Common, its freakin crazy up in the blues with the fans who rather spend that kind of cash on overpriced, water-downed (not literally, just critically) Molson Ex. Yes, but it’s nothing compared to Switzerland. And I thought Canada was the home of hockey. The fans here never stop singing, and the screaming noise level continues throughout the whole game. They’re animated and passionate. I was surprised and disappointed that Canadian fans were so calm. I was genuinely offended. She had attacked the little culture Canada has, the small amount of nationalistic sentiment I have. I was in disbelief – I couldn’t believe her. I had to go see one of the Swiss A-League (NLA) games for myself, if only to squash my anxiety that she may be right. A short moment later and she was introducing to me to this guy Martin with season tickets for the SCL Tigers. Martin, this is Michael. He’s Canadian. He wants to see a hockey game. What a cliché, but damn it if I’m not proud to wear it on my sleeve. Martin was more than happy to invite me to a game the next night, and that meant I’d get my hockey fix right in time for opening weekend of the NHL. Quite literally in the middle of nowhere Switzerland is this town Langnau, home of the SCL Tigers. 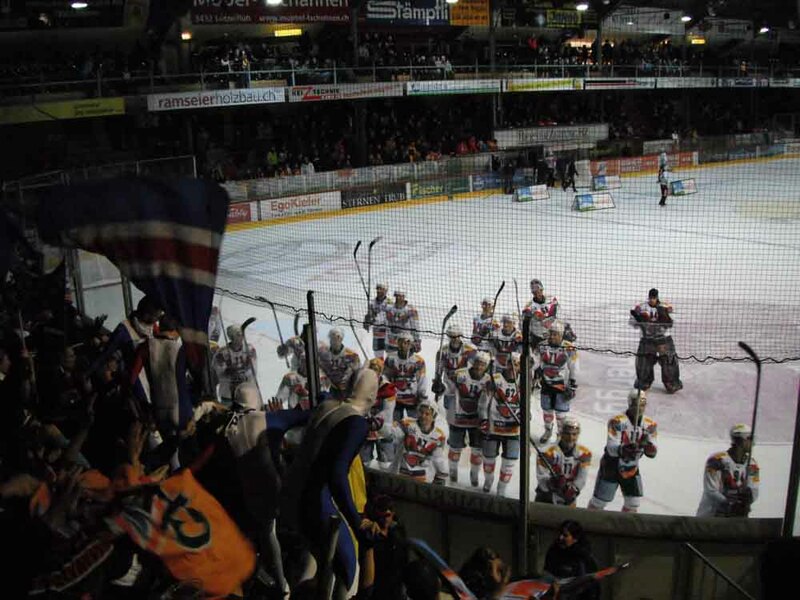 They were taking on the one team they weren’t able to beat last season, the Kloten Flyers, on Saturday, October 8th, 2011 at 19:45. Martin told me that the Tigers have only beaten the Flyers three times in forty. The Tigers made the playoffs for the first time last year since they were relegated to the top league in Switzerland thirteen years ago. A quick look at their rooster reveals one notable former NHLer: Robert Esche. With him as their starting goalie this year their chances don’t look so good. And as it turns out he allowed six goals against the night before and wasn’t even dressed for this game. What I would have given to taunt Esche in this small village, and see how the Swiss fans would have reacted to that. Now, the Tigers are one of those teams that hockey fans in North America know all too well: Small market, low budget club, but passionate fans who say goodbye to their star players year after year. The Flyers alone have five former Tigers playing for them, all quality guys. Martin says it’s frustrating as a fan but he grew up with the Tigers, and there’s no way he can abandon them. My first impression driving up to the arena is the parking lot attendant with his reflective vest waving us in with his flashlight. The only difference, and a big one at that, is that the parking is free. Then I see the arena, and it’s nothing more than a large barn. It can host over 5000 people, but it’s tiny considering it’s the big leagues here. For me, it’s perfectly suitable for this sweet nation with their cute chalets in the Alps overlooking pristine lakes. Outside is a smaller barn hosting the pregame party with beers a plenty, sausages or should say bratwurst on the grill, little brownies in the shape of hockey pucks, and even kebabs. We’ve got our beers and with the game starting we go in the main barn. I give my 46 Franc ($50) e-ticket to get scanned and walk in. It’s all concrete and cement, and walking up those steps below the bleachers I feel like I’m a kid again at the Montreal Forum getting a toasted hotdog during intermission. Then I walk in and the bright ice has that heavenly shine mixed with Euro style adverts in the faceoff circles. Above it is the orange scoreboard from a hockey videogame of the ’90’s. The game is about to start. I take my seat in the corner, the row right above where the zamboni exits onto the ice. And then I see the fans Lena was talking about. Right next to me, behind the home goalie, are the visiting team’s fans. They’re all drums a banging, flags a waving, and singing in unison. The leader with the megaphone orchestrates the melodies. Then I notice in the front are about five guys, not quite the green men of Vancouver, but the same principle in red, white and blue. The puck drops and it’s on. The Tigers lose the opening draw, and it’s hard not to notice that the Flyers (sitting 3rd in the league at the time) are skilled and working their system, while the Tigers (10th out of 12 teams) are the hard working team trying to keep pace. Within three minutes the Flyers score off a weak shot. These travelling fans go crazy, and wouldn’t stop for the rest of the game, just like Lena said. And I mean quite literally never. A close scoring chance, you don’t hear the ahh, you hear the banging drums and chanting. Penalty against, no, no, goal against, they’re cheering like nothing happened. The leader with the megaphone – I’m not sure if he saw more than five minutes of action as his chants were directed up to his fellow fans. With the game 2-1 for the Flyers in the middle of the second, I finally realized the difference between the Swiss fans and Canadian fans. I was sitting on the edge of my seat because the Flyers were putting on the pressure on the other side of the rink. The Flyers had the puck by the hash marks on the left wing boards. The Tigers’ defensemen had a huge mental lapse leaving the opposing center to receive a beauty pass all alone in the slot. With a left-handed shot, he deeked forehand, drew the goalie out of his crease, and quickly went backhand. With half the net empty, I knew he scored even before he shovelled it in. The visiting fans next to me didn’t react. They didn’t know it was in. The home crowd sulked a bit. The Flyers players were humble in their celebration. In the longest delayed reaction I have ever witnessed, about five seconds after the goal, the visiting fans finally noticed that the action had stopped and their players were hugging in celebration. Then they erupted in theirs’ as they deduced that they must have scored. Now, I don’t want to put down these Swiss fans, because they are great hockey fans with tons of energy and intensity that I don’t necessarily see in North America. I am, however, defending my own Canadian fans, and in particular, Canadiens fans from Lena’s critique. Sure, hockey in Canada is coming down with a bad case of hooligan behaviour (Vancouver riot anyone), making English football seem all crumpets and tea – but even the diehard collective of knowledgeable Toronto fans packed in the Bell centre who burst out of their chairs the instant the puck crosses the line is truly impressive, and personally, infuriating. Maybe we seemed quiet to Lena because we’re very much focused on the game, unless a fight explodes up in the nosebleeds (or recently that Boston fan that, by the way, was from Quebec, who got jumped in the reds of the Bell Centre). We oooh and ahh with the missed chances and crushing hits. We boo the refs mercilessly upon missed calls, and taunt former heroes who have found greener and much larger pastures elsewhere. And when the team can’t seem to generate any offence, if you listen very closely it’s not silence you hear but a subtle sound of grinding teeth. Hockey fans in Montreal are two headed, bandwagoning monsters. When all is good we praise our team with religious accolades like in Bob we Trust or Jesus Price. When the team is on a losing streak, and a streak can be one loss, the fans begin throwing everyone under the bus claiming that they could manage/coach better. Some lunatic fans actually think they can play better too. Thank God Brian Gionta doesn’t understand the French guys on L’AntiChambre. Hockey is very serious here and it flirts with being up-tight. The Bell Centre can be a social scene for the trendy and business class. In this way Lena may be right about Canadian fans. My defence then is definitely a biased and romantic perspective that dates back to the Forum, or maybe just the local pub. What happened to the wave? Where are those four fans that paint their bodies with the letters H-A-B-S? Why do I feel under-dressed when I luck out on some free tickets in the reds? I’m sure the answers to those questions are somewhere close to where you can find the standing section of the Forum. In Langnau, the atmosphere is much different. It’s really about having fun being a fan, and enjoying a game. After all, hockey is just a game, right? There’s no depression after a lost, the night’s not over. The Tigers lost, but going to game was just the beginning of the night, and the barn that hosted the pregame party still had the post game one. Whether Swiss fans are better than Canadian ones, I’m not sure, but I do see her point. How can I judge whether or not these Swiss fans are better than Habs fans when the numbers are incomparable? She isn’t saying that Langnau is a better hockey town than Montreal, just a better game experience. I think it’s just a different fan culture, like how in the same city fans of the CFL and NHL behave differently. 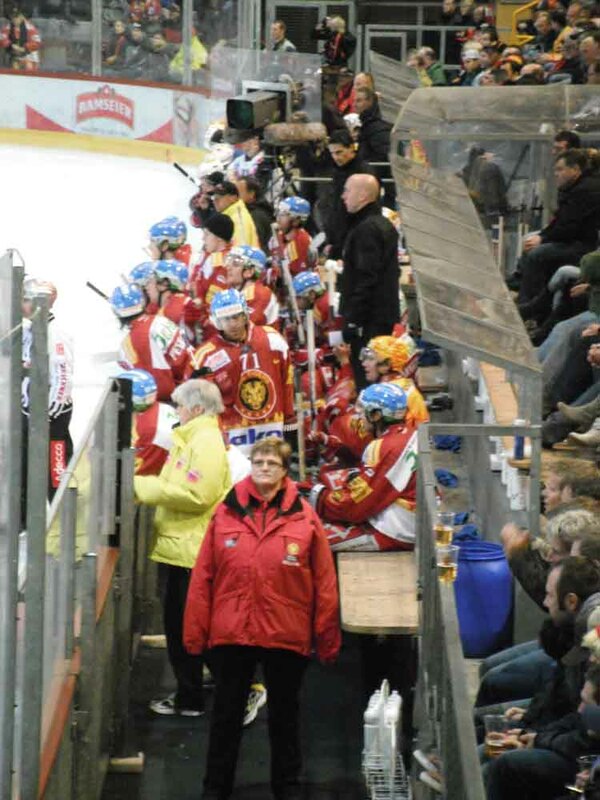 I loved my experience in Langnau, and love the passion for hockey in Switzerland. I’m proud of how the Habs regularly take Swiss players like Mark Streit, Yannick Weber and most recently Raphael Diaz (and then how we love degrading them by making these Swiss defensemen into auxiliary fourth liners). But the Swiss fans already know this and then round off the other Swiss NHLers, Jonas Hiller, Nino Niederreiter, and Luca Sbisa. Funny how the six Swiss NHLers are paired up on three teams. Maybe it’s because Swiss-German is truly a bizarre language that nobody else can learn. Maybe. It sounds like a nice story, but do you know that our star goalie from last season, Benjamin Conz, a good youngster who you’ll probably see in the NHL soon enough, signed this year with Aebischer’s former club in Lugano. Looks to me like he lost his job and needed a new one. There is no denying that they know their hockey here. The Swiss national team has been improving every year and can longer be taken lightly like Norway or Latvia. They host the oldest annual invitational hockey tournament the Spengler Cup in Davos each Christmas holiday. Speaking of Davos, they beat the New York Rangers this year in an exhibition game. Swiss hockey fans rejoiced the country over. These developments show that hockey is only gaining popularity in Switzerland. But let’s hope the Swiss fans never achieve Canada’s paradoxical level of seriousness and childishness when routing for the team and game we hold so dear. Thanks for the correction. Dully noted. Great stuff! I am also Canadian, and think that Europeans are a bit more “evolved” in that they follow sports teams not to just keep up with the W-L column, but to be a part of the booster club. i followed my hometown frankfurt lions team in germany for 15 years, half of my life … until they were no more, due to some dubious financial problems. happens a lot in the del. having been to innumerable games in germany and some in canada (i’m living in TO right now), i wouldn’t say that european fans are better. canadian and european fans are just by default fundamentally different by default, no matter which sport. my first nhl game was leafs – islanders in october 2010, and it was a total different experience from what i had. sitting in my seat in row 23, i realized that you do look kinda stupid shouting obscenities at the officials. when you’re standing, that’s a whole different story. those compassionate fans that are singing, supporting, doing something active for a full 60 minutes are usually only found in areas with areas without seats. i’m not gonna try to explain it, but that’s the most basic difference. it feels a bit more blue collar, while seats are generally considered white collar … like going to the movies. when i went to huge arenas like cologne or mannheim, we had seats. felt kinda weird, but you’ll take it when it’s germany – russia (2-3!) or mannheim – san jose. another thing to consider is the size of the arenas: something below 17.500 is a rarity in the nhl (capacity, not attentance. phoenix, dallas and columbus silently weep. oh, and the devils, too.) – in most of europe, that’s a rarity. 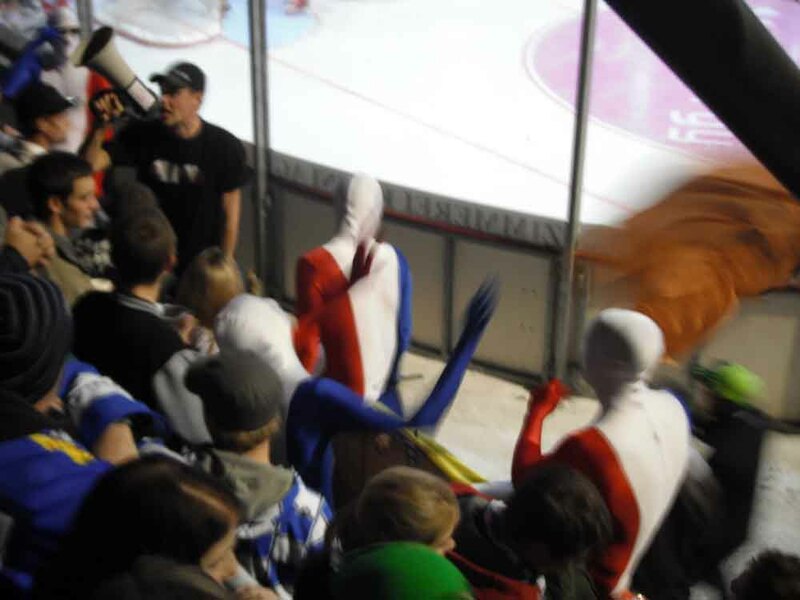 hockey is not the biggest sport in a lot of countries … hell, even in russia there’s more people showing up for soccer matches than for hockey games, even though that’s of course a country with a huge hockey tradition, and it’s comparable in size to either canada or the states. the rest of europe is tiny in comparison. slovenia is way smaller than the smallest province in canada, and that’s one of the reasons why anze kopitar is the only slovenian playing in the nhl. maybe finland is the only country where hockey’s actually the absolute no.1. in some towns in germany, it’s a good night when more than 2,500 show up. and it’s not a small arena. incredible. sooo anyways: playing in smaller arenas makes every fan activity way more audible. it’s so much more of a goosebumpe-y experience than any (outdoor) soccer game i’ve been to. and it’s not animated … WE do the animation. but, to be fair, it’s not that easy to pick up on the play when you’re standing in a big crowd, almost on ice level, trying to see what’s happening on the other end of the ice. it’s hard to see the puck, so you react on hockey instinct (if there) or the reaction of the players. oh, and you know what was the most awesome season ever? the year of the last lockout. hell, we had giggy in his prime in goal, doug weight and a young stephane robidas who blossomed into one of the better physical, defensivwe d-men in the league (before he was bouncing around between minors and the nhl), while being an offensive force for the lions. the team finished 1st after the regular season and lost to archrival mannheim in the quarters after robidas was out with an injury. i don’t disrespect for the way europeans cheer for their teams. but i also just don’t quite get it.